A liquidity trap occurs when low/zero interest rates fail to stimulate consumer spending and monetary policy becomes ineffective. In this situation, an increase in the money supply will fail to increase spending and investment because interest rates can't fall any further. A liquidity trap means consumers' preference for liquid assets (cash) is greater than the rate at which the quantity of money is growing. So any attempt by policymakers to get individuals to hold non-liquid assets in the form of consumption by increasing the money supply won't work. 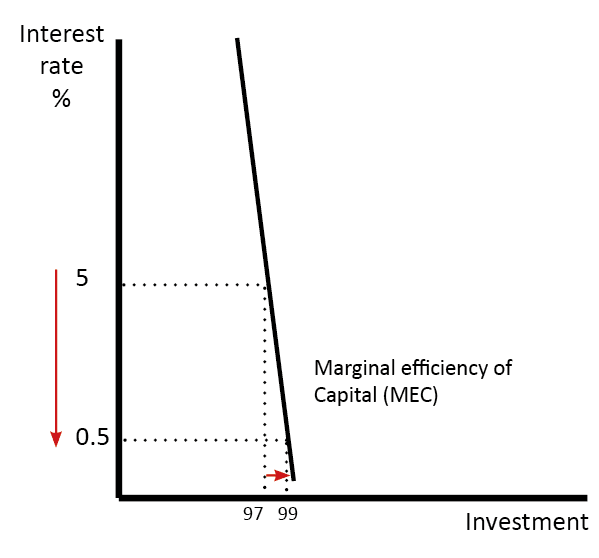 In the post-war period, the macro-economy was managed by changing interest rates and there was no incidence of a liquidity trap (outside Japan). However, in 2008, the global credit crunch caused widespread financial disruption, a fall in the money supply and serious economic recession. Interest rates in Europe, US and UK all fell to 0.5% - but, the interest rate cuts were very slow to cause economic activity to return to normal. 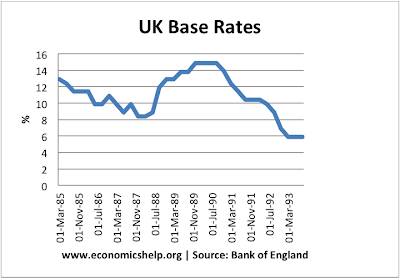 In the UK, base interest rates were cut from 5% in 2008 to 0.5% in March 2009. Yet, for a considerable time, the economy remained in recession and growth remained weak. This period is a good example of a liquidity trap. Interest rate cuts to 0.5% did little to create a strong economic recovery. 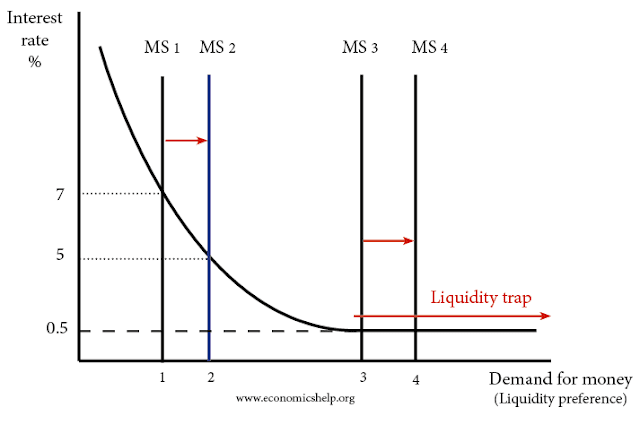 A feature of a liquidity trap is that increasing the money supply has little effect on boosting demand. One reason is that increasing the money supply has no effect on reducing interest rates. When interest rates are 0.5% and there is a further increase in the money supply, the demand for holding money in cash rather than investing in bonds is perfectly elastic. In the liquidity trap, there was an increase in the monetary base (due to Quantitative easing) but the broad money supply (M4) showed little increase. 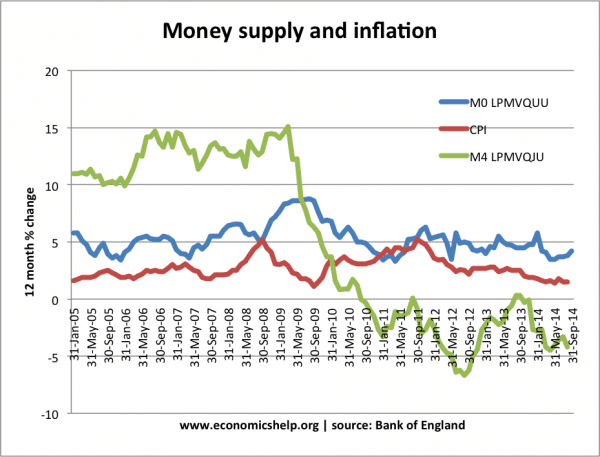 MO (monetary base) increased by over 7% in 2009 - but, it couldn't stop the decline in M4. 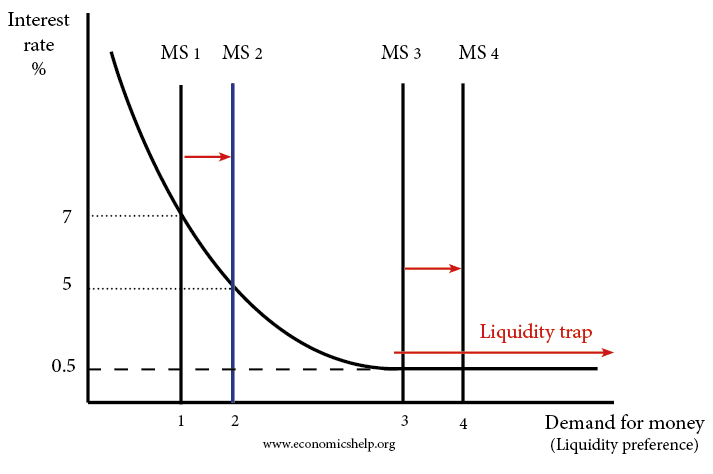 Why do Liquidity Traps Occur? Inelastic demand for investment. In a liquidity trap, firms are not tempted by lower interest rates. 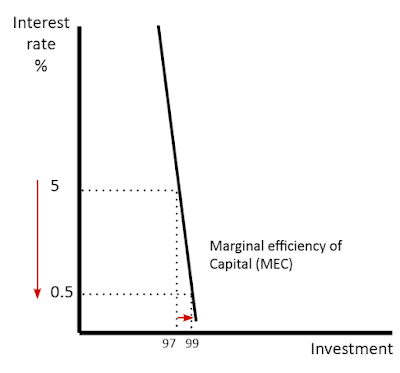 The marginal efficiency of capital indicates the rate of return from investment. Usually, lower interest rates make it more profitable to borrow and invest. However, in a recession, firms don't want to invest because they expect low demand. Therefore, even though it may be cheap to borrow - they don't want to risk making investment. Preference for saving. Liquidity traps occur during periods of recessions and a gloomy economic outlook. Consumers, firms and banks are pessimistic about the future, so they look to increase their precautionary savings and it is difficult to get them to spend. 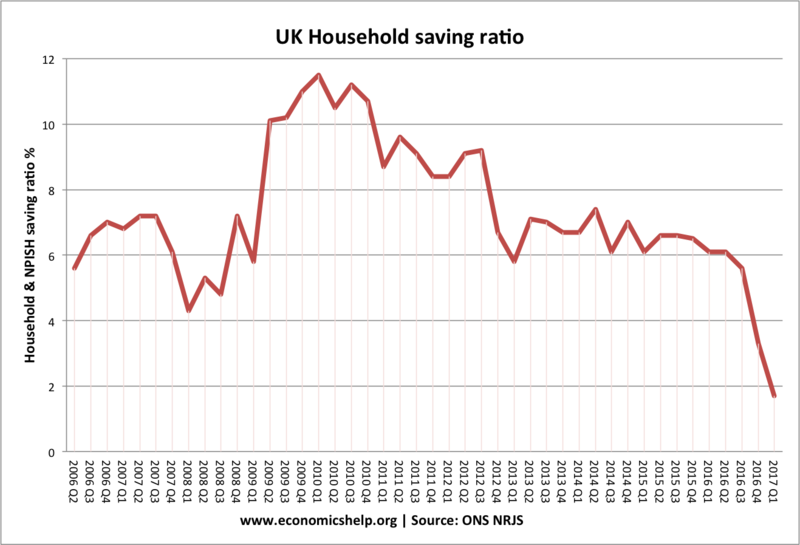 This rise in the savings ratio means spending falls. Also, in recessions banks are much more reluctant to lend. Also, cutting the base rate to 0% may not translate into lower commercial bank lending rates as banks just don't want to lend. 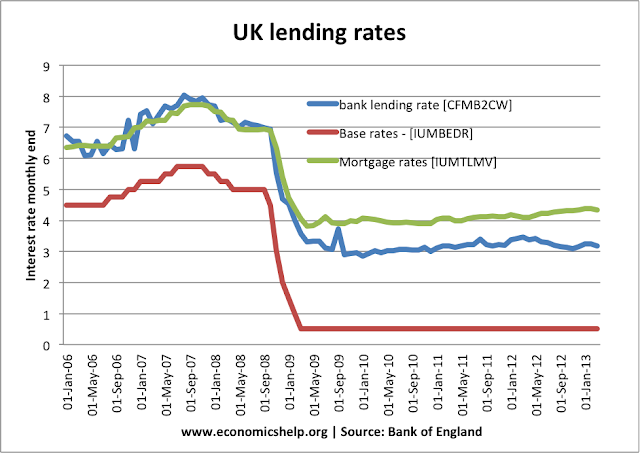 at the start of the credit crunch, there was a sharp rise in the UK saving ratio. Credit Crunch. Banks lost significant sums of money in buying sub-prime debt which defaulted. Therefore, they are seeking to improve their balance sheets. They are reluctant to lend so even if firms and consumers want to take advantage of low-interest rates, banks won't lend them the money. Unwillingness to hold bonds. If interest rates are zero, investors will expect interest rates to rise sometime. If interest rates rise, the price of bonds falls (see: inverse relationship between bond yields and bond prices) Therefore, investors would rather keep cash savings than hold bonds. In a liquidity trap, commercial banks may not pass base rate onto consumers. Helicopter money - more direct than quantitative easing as rather than buying assets from banks, the money is given directly to the people. Expansionary Fiscal Policy - Keynes argued in a liquidity trap, it is necessary for a government to pursue direct investment in the economy. For example, building public work schemes has the effect of creating demand and getting unused resources back into the circular flow. Interest rates reflect the cost of borrowing. They also indicate the return on savings/bonds. Commerical banks charge a higher interest rate on loans and pay a lower rate on savings. 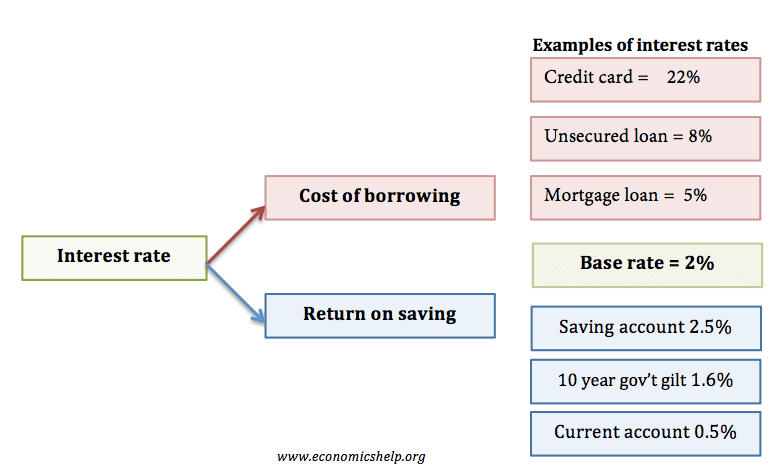 This difference between the cost of borrowing and rate of return on savings is part of the reason banks are profitable. Lending customers deposits at a higher rate than they pay customers interest on their savings. 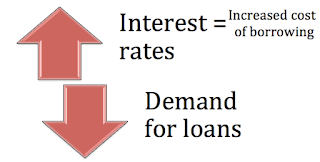 Interest rates are controlled by the Central Bank (sometimes governments set interest rates directly). The Central Bank change a base rate. This base rate is the rate they charge to commercial banks. If the base rate rises, commercial banks will tend to put up their standard variable rates. Mortgage and loan repayments increase. This reduces consumer disposable income and consumer spending further. Fall in asset prices. Higher interest rates can make it less attractive to buy a house with a mortgage leading to lower house prices. If consumer spending and investment falls, this will lead to lower AD. Therefore this causes a fall in Real GDP or at least a fall in the rate of economic growth. Lower growth will tend to increase unemployment. 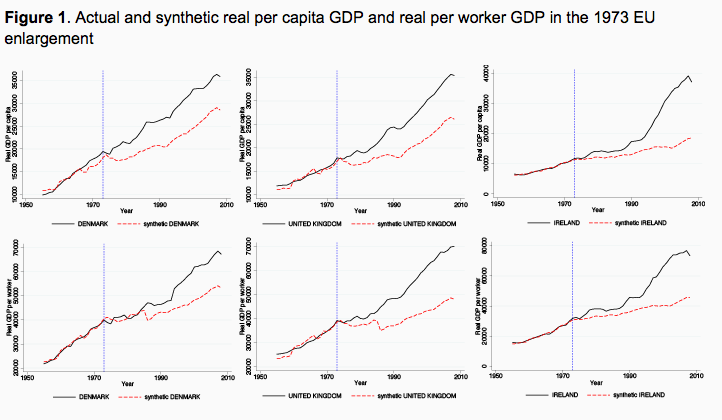 With less output, firms demand less workers. Lower growth will also help to reduce inflation. 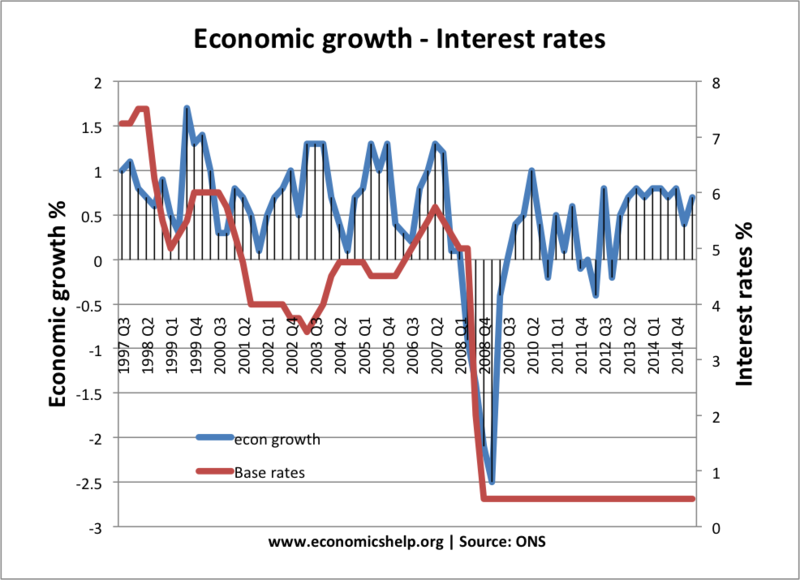 If the economy is at full capacity a rise in interest rates may reduce inflation, but not growth. However, if there is already spare capacity then rising interest rates could cause a recession. Higher return on saving may give some consumers a high income. This will be consumers like pensioners. However, in the UK, the savings ratio is quite high, therefore the income effect of a rise in interest rates is likely to be quite low. The substitution effect will be higher. 4. It depends whether commercial banks pass interest rate cut onto consumers. 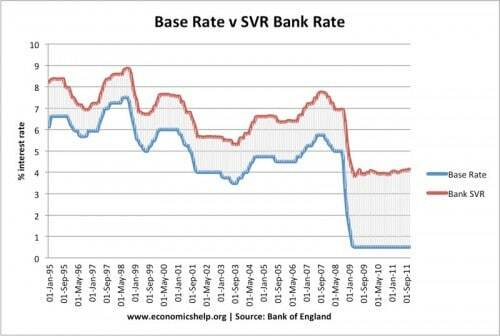 In the credit crunch, banks didn't reduce their Standard Variable Rate as much as the Bank of England cut its base rate. In Credit Crunch of 2008, lower interest rates failed to boost economic growth. 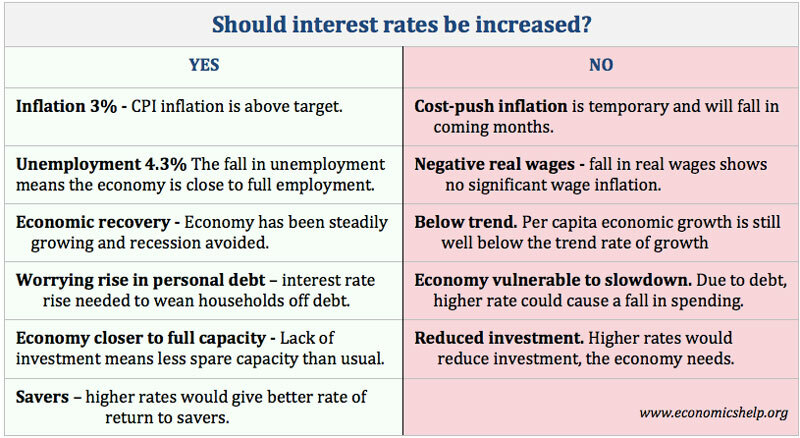 How does Bank of England decide whether to increase interest rates? It also has to consider the type of inflation. Is it temporary cost-push inflation or underlying inflationary pressures. Is the economy reaching full capacity? Should interest rates go up? Real interest rate = nominal interest rate - inflation rate. If interest rates are 5%, and inflation is 3%, the real interest rate is 2% - savers will see a positive return on savings. See previous decade - 1960s. The 1970s was not just an era of dayglow trousers, lava lamps and the emergence of punk rock. It was a traumatic economic decade of stagflation, a three day week and the return of unemployment. Yet, despite some headline-grabbing crisis - it was also a decade of rising living standards, the growth of credit and rising property prices. Graph showing combination of high inflation and volatile output. 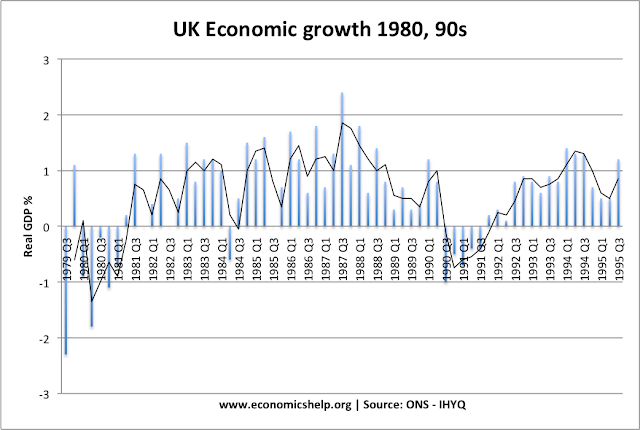 The early years of the 1970s were a period of rapid economic growth. The Bank of England deregulated the mortgage market - meaning High Street Banks could now lend mortgages (not just local building societies). This helped fuel a rise in house prices and consumer wealth. Barber Boom of 1972. In the 1972 budget, the chancellor Anthony Barber made a dash for growth - with large tax cuts against a backdrop of high economic growth. Growth of Credit. It was in the 1970s, we saw the first mass use of credit cards (Access). This helped create a consumer bubble. Rising wages, partly due to strength of unions. 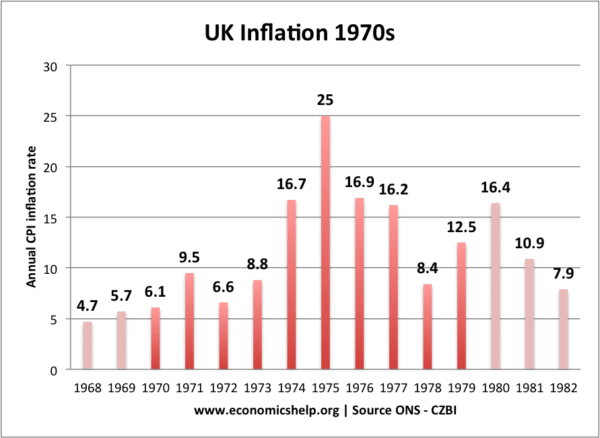 The inflationary budget of 1972. Growth in credit and consumer spending. Oil price shock of 1973, leading to 70% increase in oil prices. Belatedly, the government tried to deal with unemployment, through higher interest rates. Also, the Heath government tried capping wages. 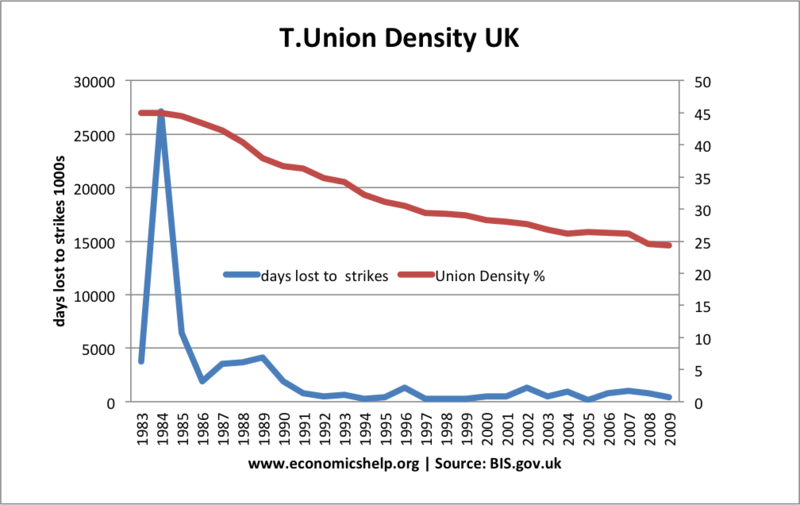 This was fuel for industrial unrest, leading to frequent and widespread strikes. In 1973, the miners went on strike and were also joined by sympathetic trades unionists - led by, amongst others, the young and infectiously strident Arthur Scargill. 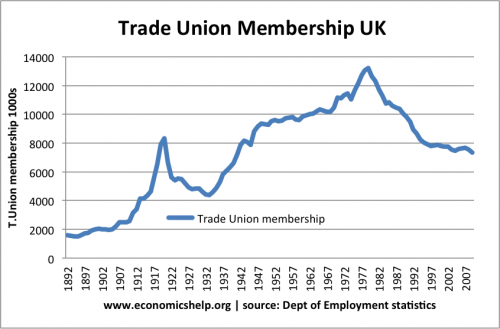 Growing up in Thatcher's Britain, it is hard to remember how powerful trades unions actually were at the time. During Heath's government 9 million working days were lost to strike action - plus more to practises such as 'working to rule'. Flying pickets successfully blocked coal and coke factories, which at the time produced the majority of the nation's power. Suddenly the life source of Britain's energy was being blocked. At the height of the strike, Britain was on a 3 day week, with the Prime Minister, Edward Heath making public appeals to conserve energy. 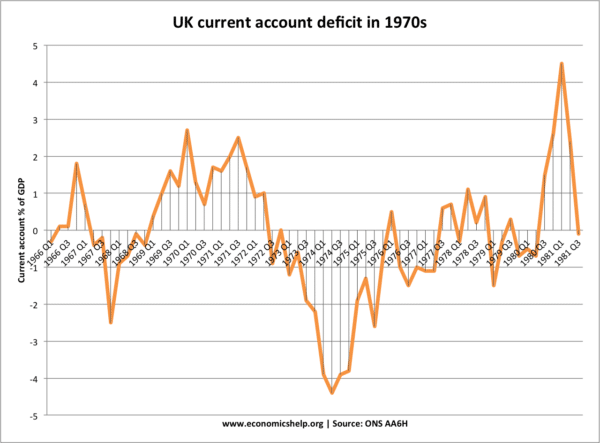 1974, also saw an unwelcome return of a real recession. This recession was caused by the end of the Barber boom and falling living standards from rising prices. In the post-war period, we had booms and busts, but, the bust were relatively mild, with only very minor declines in output. But, in 1974, output fell 3.4% causing a return of high unemployment not seen since the 1930s. Since oil had become an intrinsic part of the economy, we had taken it for granted that oil could be bought cheaply. The 1960s and early 1970s, saw a rapid rise in ownership of cars and motoring. Britain enthusiastically embraced the motor car - helped by rising incomes and cheap petrol. But, the 1973 oil crisis, changed all that. Suddenly the price of petrol more than doubled and the UK faced an energy crisis to go along with a spike in inflation. The government seemed powerless as Britain was put on a three day week and TV was turned off at 10.30pm. Emergency speed limits were introduced to conserve petrol. If in 1957, we had never had it so good, by 1973, it seemed we had never had it so bad. It was a return to the 1940s austerity; but with no obvious enemy, the public were less forgiving of this inconvenience. 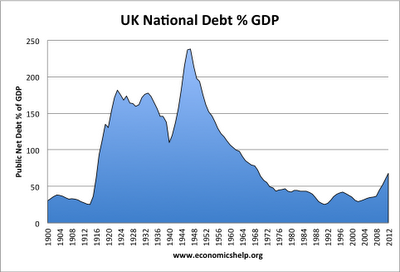 In 1976, the UK needed to apply to the IMF for a bailout. This was due to high budget deficit and also concerns over the value of Sterling. 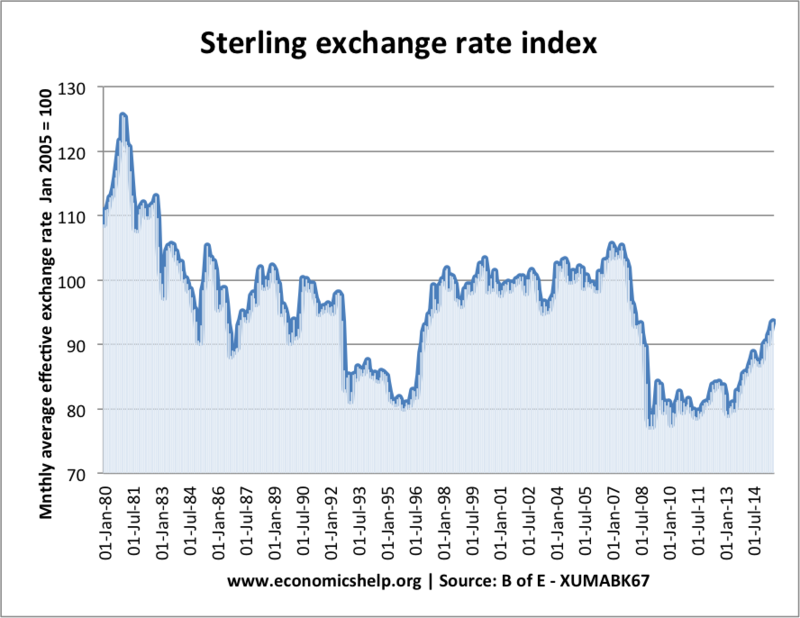 Markets believed Sterling was overvalued and so kept selling. This caused the Pound to depreciate. Britain asked the IMF for a £2.3bn bail out in 1976 saying unemployment and inflation were at exceptional levels. A run on the pound refers to a situation where international investors become nervous over holding sterling and sterling assets, and so sell as quickly as possible. A run on the pound may occur when markets feel the Pound is overvalued and likely to fall quickly. If markets expect the pound to fall, they will sell quickly before making a loss. What may cause a run on the Pound? A run on the pound is more likely in a semi fixed exchange rate. e.g. when the Government is committed to trying to keep the Pound at a certain level. If markets feel this level is unsustainable they may keep selling Pounds until the government is forced to devalue. 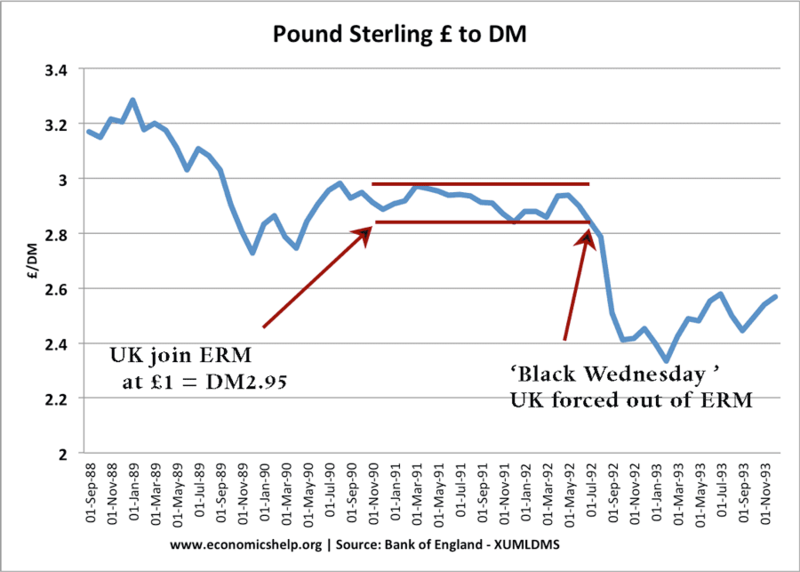 For example, in 1992, the UK tried to maintain value of Sterling in ERM, but, ultimately markets forced the UK out and we had to devalue. 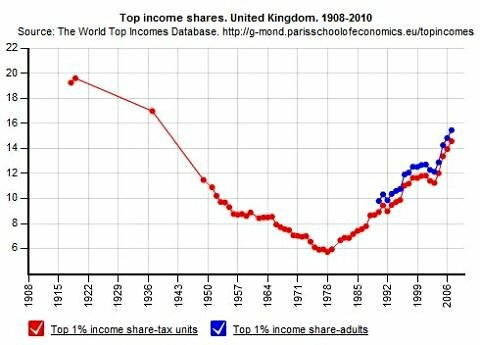 The graph above shows the near 20% devaluation in 1992. 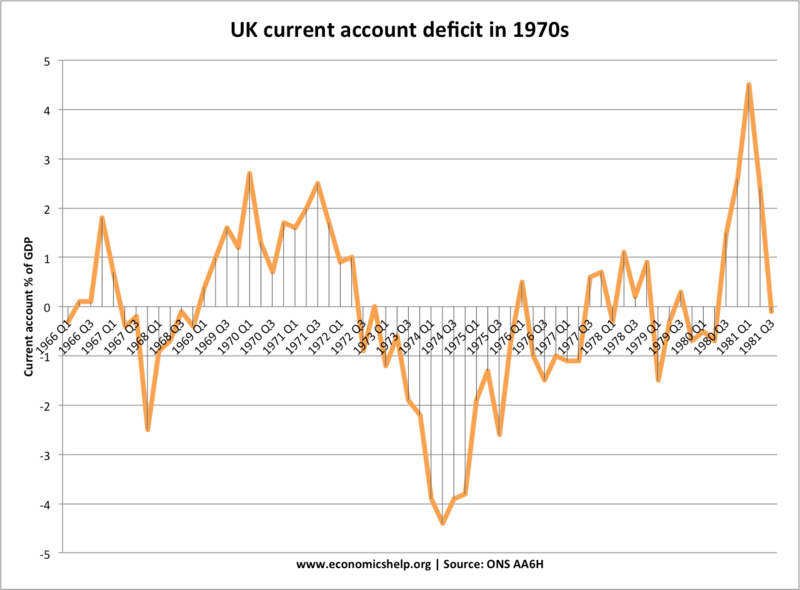 In 1976, there was another on the Pound as markets feared the UK's fiscal position. Financial crisis depreciation. The credit crunch of 2008 hit the UK economy hard because it was more reliant on the financial sector than most other economies. 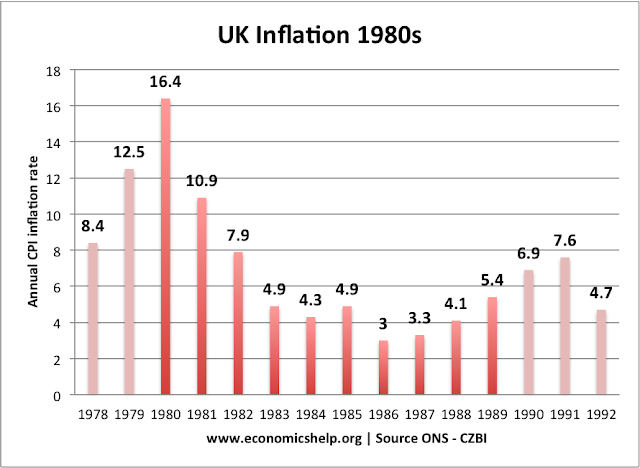 High inflation - high inflation reduces the value of Pound Sterling. Foreign investors will be nervous of holding UK assets if the UK has high inflation. Threat of sovereign debt default. If markets feel government borrowing is too high and unsustainable then there is a risk of foreigners losing their government bonds. Therefore, the market will sell bonds causing an outflow of foreign currency and fall in value of sterling. This can build up a momentum effect. As the fall in the currency can alarm other investors. Is the UK at risk from a Run on the Pound? No. Firstly the Pound is floating i.e. governments are not trying to keep its value high. The Pound has already depreciated by about 15% since the Brexit vote in June 2016. - This wouldn't count as a run on the pound but large depreciation. With a floating exchange rate, there is less chance of markets feeling an exchange rate is fundamentally overvalued. UK's debt is a concern (national debt at over 80% of GDP), but, we still retain good credit rating and despite rising debt, bond yields fell - reflecting the fact markets see UK debt as a safe investment. Would membership of Euro protect against a run on the Pound? If we joined the Euro, by definition we couldn't have a run on the Pound, but, it doesn't solve underlying problems like lack of competitiveness, excessive government borrowing, negative growth. Being outside the Euro, would give Greece more flexibility for dealing with their crisis. 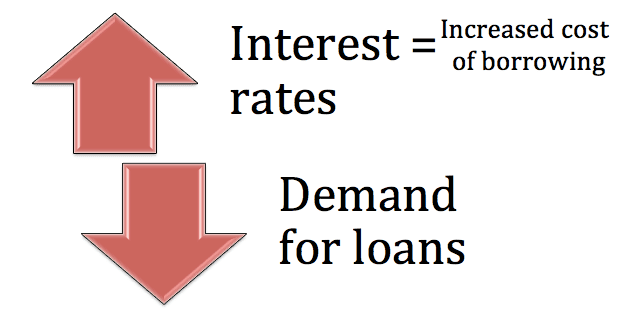 Interest rates can influence the rate of inflation and the rate of economic growth. Generally, an increase in inflation leads to higher interest rates. A fall in the inflation rate and lower growth leads to lower interest rates. Typically, nominal interest rates are 1 - 2 % higher than inflation. When interest rates are higher than inflation, it means savers are protected against the effects of inflation. However, in 2008 and 2011, we had a period of negative real interest rates. This meant the inflation rate was higher than the base rate. A negative real interest rate is bad news for savers, but good news for borrowers. 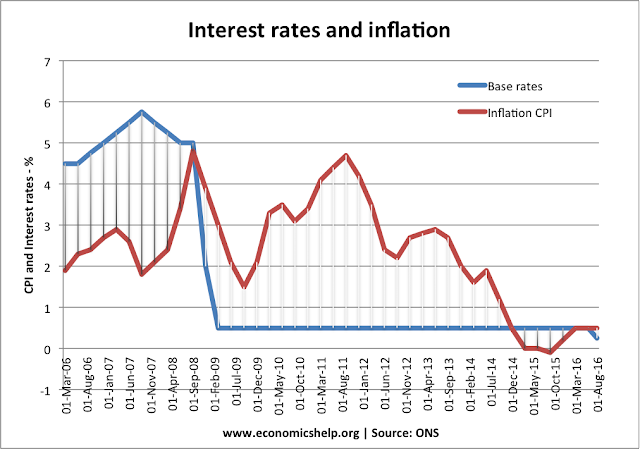 If inflation rises, generally, the Bank of England increases interest rates to reduce inflationary pressure. Higher interest rates tend to reduce consumer spending. This is because homeowners see an increase in the cost of their mortgage payments and have less disposable income. Therefore, they spend less. 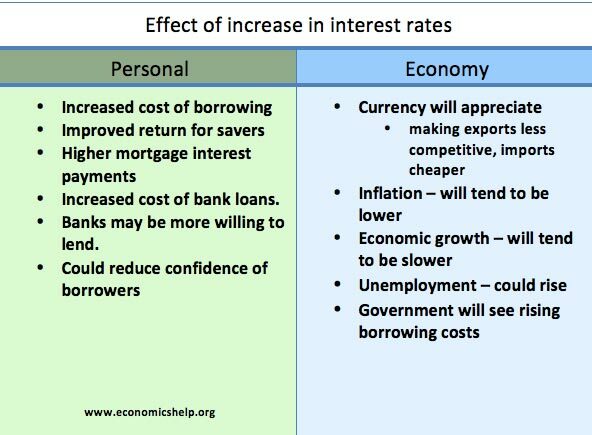 Also, higher interest rates increase the incentive to save and reduce the incentive to borrow. Therefore, an increase in interest rates tends to reduce the rate of economic growth and prevent inflationary pressures. If inflation falls below the target, there is likely to be a fall in the rate of economic growth, and the Central Bank may fear a recession. Therefore, in response, they may cut interest rates to try and boost economic growth. 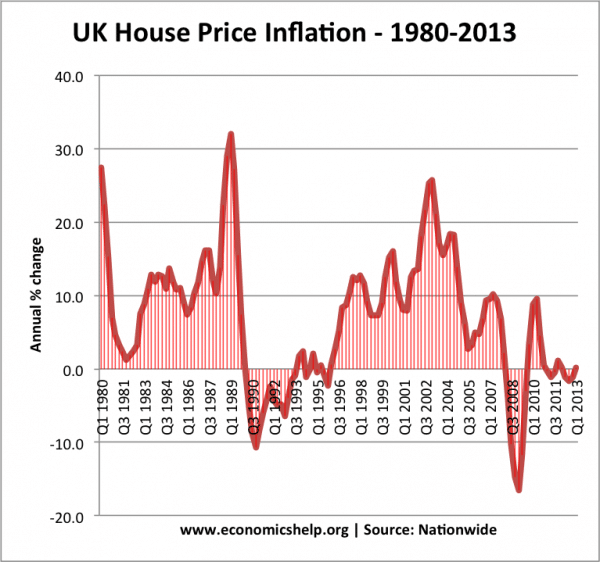 House Price falls provide a powerful negative impact on spending. Lower interest rates should boost spending. 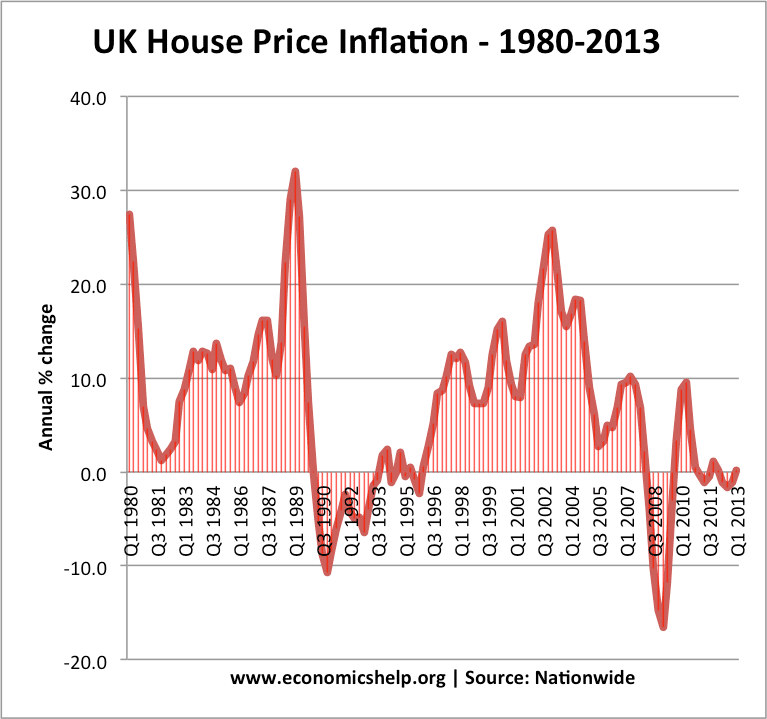 But, with house prices falling 20% since the peak, this has reduced consumer wealth and therefore reduced spending. Global downturn. Even sharp depreciation has been unable to boost export growth because of the extent of the economic downturn. Time Lags. A cut in interest rates can take a long time to have an effect. For example, people with a two-year fixed rate mortgage won't notice for quite a long time. (until they re-mortgage. Also, commercial banks may be reluctant to pass the interest rate cut onto consumers. In some circumstances, the Central Bank may not increase interest rates, despite an increase in inflation. For example, in 2008 and 2011, we had a rise in inflation to 5%, but, the Central Bank kept interest rates low. Why? They felt economy was at risk of inflation. Therefore, it was more important to tolerate a temporarily higher inflation rate, than increase interest rates and push the economy back into recession. Does low inflation always mean low-interest rates? Readers Question: What are the advantages and disadvantages of the WTO formally the GATT? Provide legal framework for negotiation of trade disputes. This aims to provide greater stability and predictability in trade. Trade without discrimination - avoiding preferential trade agreements. WTO is not a completely free trade body. It allows tariffs and trade restrictions under certain conditions, e.g. protection against 'dumping' of cheap surplus goods. WTO is committed to economic development. For example, recent rounds have put pressure on developed countries to accelerate restrictions on imports from the least-developing countries. Free trade encourages greater competitiveness. Through free trade, firms face a higher incentive to cut costs. For example, a domestic monopoly may now face competition from foreign firms. The law of comparative advantage states that free trade will enable an increase in economic welfare. This is because countries can specialise in producing goods where they have a lower opportunity cost. 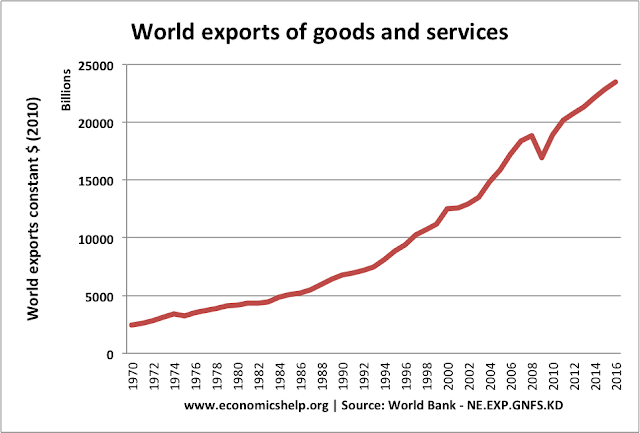 To what extent has the WTO being able to promote free trade? The WTO has over 160 members representing 98 per cent of world trade. Over 20 countries are seeking to join the WTO. An increased number of trade disputes have been brought to the WTO, showing the WTO is a forum for helping to solve disputes. According to Ralph Ossa, "WTO success: No trade agreement but no trade war"
VOX.eu 11 June 2015. the value of WTO in preventing trade wars could be estimated at up to $340 billion per year. 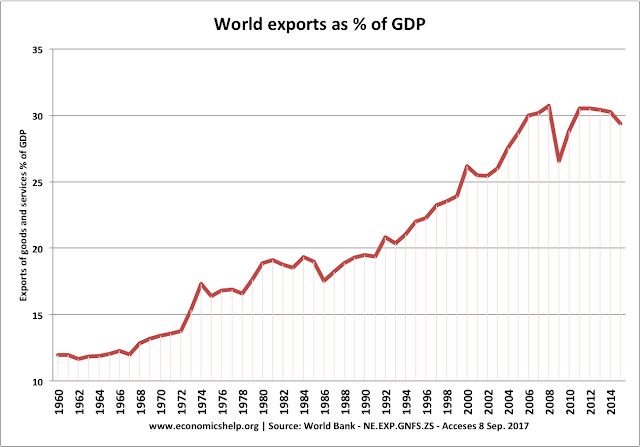 World exports as a % of GDP have increased from 22% of GDP in 1995 (when WTO formed to just under 30% in 2015. Indicating importance of trade to global economy. Free trade may prevent developing economies develop their infant industries. For example, if a developing economy was trying to diversify their economy to develop a new manufacturing industry, they may be unable to do it without some tariff protection. Difficulty of making progress. WTO trade deals have been quite difficult to form consensus. Various rounds have taken many years to slowly progress. It results in countries seeking alternatives such as TIPP or local bilateral deals. WTO trade deals still encompass a lot of protectionism in areas like agriculture. Protectionist tariffs which primarily benefit richer nations, such as the EU and US. WTO has implemented strong defense of TRIPs ‘Trade Related Intellectual Property’ rights These allow firms to implement patents and copyrights. In areas, such as life-saving drugs, it has raised the price and made it less affordable for developing countries. WTO has rules which favour multinationals. For example, 'most favoured nation' principle means countries should trade without discrimination. This has advantages but can mean developing countires cannot give preference to local contractors, but may have to choose foreign multinationals - whatever their history in repatriation of profit, investment in area. In response to this the WTO may say that free trade has been an important engine of growth for developing countries in Asia. Although there may be some short term pain, it is worth it in the long run. Also the WTO has sought to give exemptions for developing countries; enabling in principle the idea developing countries should be allowed to limit imports more than developed countries. Unemployment - A price worth paying for lower inflation? 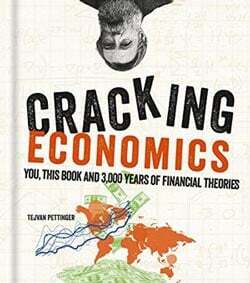 "Rising unemployment and the recession have been the price that we have had to pay to get inflation down. That price is well worth paying."" 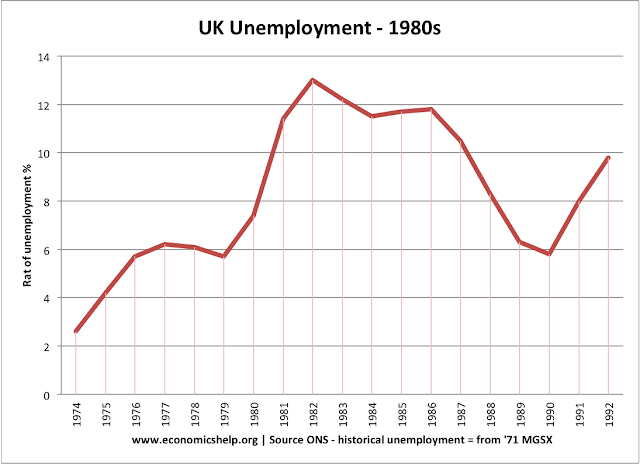 Unemployment started increasing in 1990 and rose to over 3 million in 1993. 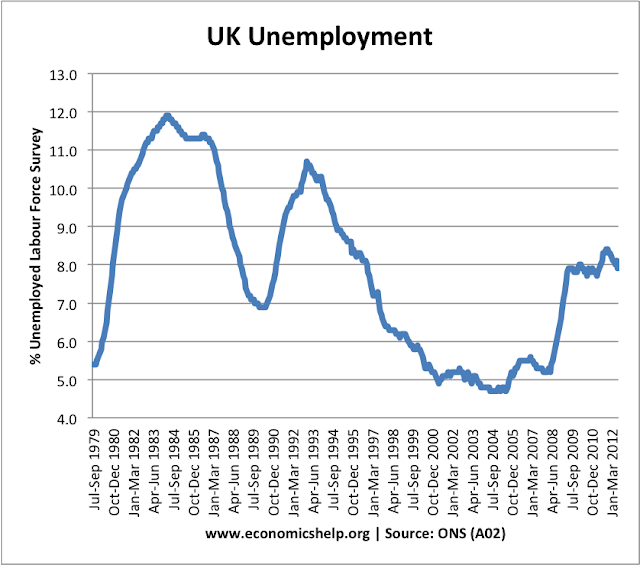 John Major also said "If it's not hurting, it's not working"
Unemployment vs Inflation is a trade off that policy makers often face. But, this particular statement was widely seen as a political gaffe or just a callous disregard for the costs of unemployment. To make such a bold statement is to suggest the government cares little for the personal cost of those who are made unemployed, but is it justified? and is there any economic rationale behind this? What is the justification for making this statement? 1. The unemployment will only be temporary and a necessary step to overcome the inflationary pressures in the economy. If inflation is high, it is invariably necessary to slowdown the economy to reduce inflation. There are no easy ways to reduce inflation. To reduce inflation will require either tight Monetary policy (higher interest rates) or tight fiscal policy (higher taxes and lower government spending.) These policies will reduce aggregate demand and reduce inflationary pressures. However, these will cause a slowdown in growth and rise in unemployment. However, this slowdown is only temporary and after inflation has been reduced and people expect lower inflation, the economy will be able to expand creating low unemployment and low inflation. To some extent N.Lamont will claim to be vindicated by events. Although unemployment rose to 3 million in the early 1990s, inflation was reduced and since then the economy has experienced a long period of uninterrupted growth without inflation and unemployment has fallen. It is argued that inflation leads to lower living standards in the long run. High inflation creates uncertainty and confusion about future prices and costs. 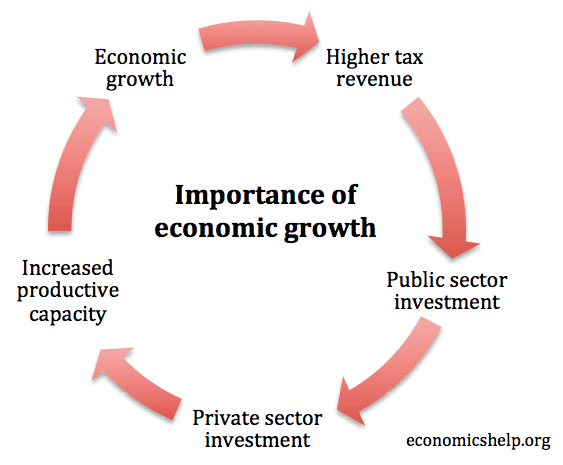 This tends to reduce business investment and leads to slower growth. High inflation also creates menu costs for the economy and more importantly will contribute to deteriorating competitiveness in the economy. 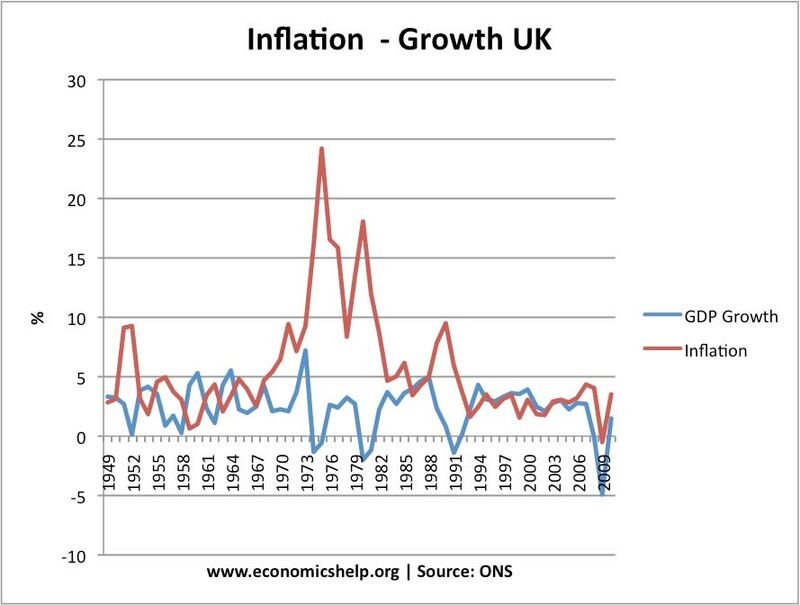 Unless inflation is reduced the economy will always grow at a slower rate than it could with low and stable inflation. It is widely accepted that previous inflation rates have a strong bearing on future inflation. If an economy experiences high inflation, people expect high inflation in the future. This becomes self fulfilling as workers demand higher wages and firms push up costs. If inflation is reduced then it becomes much easier to keep it low in the future. When the Conservative party came to power in 1979, inflation was over 20% the government implemented high interest rates and tight fiscal policy in an attempt to control the money supply and inflation. They were successful in reducing inflation but at the cost of a deep recession. Unemployment rose to 3 million and high rates of unemployment persisted until the late 1980s. Arguably the social costs of unemployment are far greater than inflation. If there are lower levels of investment it is not as damaging and dispiriting as having no work. The fact that the early 1980s saw many riots in the inner cities show the social problems which unemployment can create. If your only target is low inflation then the danger is that the monetary authorities will become blind to other economic issues. It is my belief that the 1981 recession was deeper than necessary. The enthusiasm to reduce inflation was overdone; if they had given greater importance to unemployment they would not have persisted with anti inflationary policies for so long. Similarly the 1991 recession was deeper than necessary because of the insistence of remaining in Exchange Rate Mechanism for so long. True, low inflation is important but to target at the exclusion of all else misses the whole point. One irony of the statement was that the inflation was largely avoidable. The economy was allowed to expand far too quickly in the late 1980s leading to the boom and inflation. If the economic cycle had been better stabilised the government wouldn't have been left with the difficult dilemma. The danger of targeting only inflation becomes more apparent in a period of stagflation. 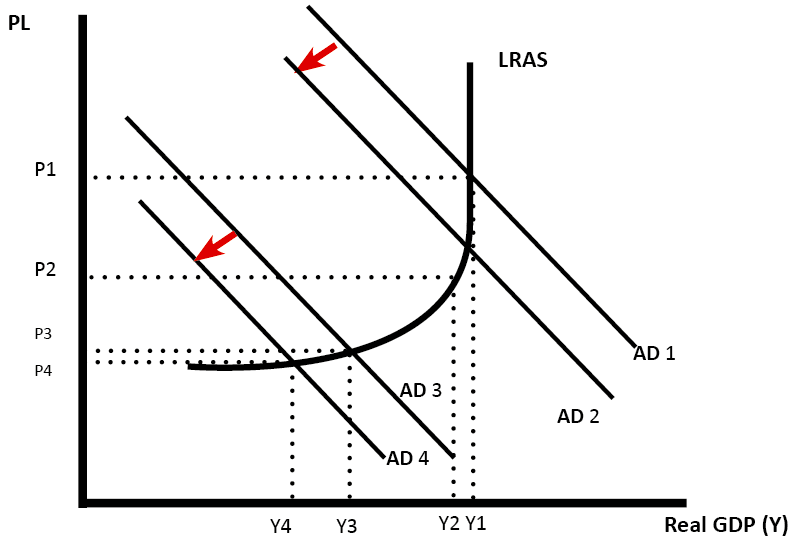 This means both inflation and unemployment rise due to the Aggregate Supply shifting to the left. In this case, keeping to a low inflation target risks causing a widespread downturn in the economy. In periods of stagflation flexibility may be required in inflation targets, even if this risks reducing confidence in inflation policy.